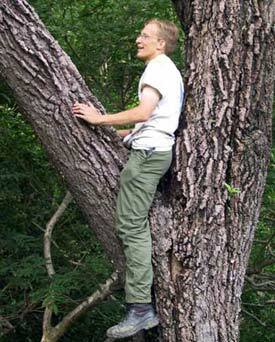 A man sitting on top a large branch of a North American morning wood. The North American morning wood (or morning glory) is a species of tree belonging to the Erectae family, closely related to the hardy palms species of palm trees. The species evolved from the much smaller Asians plant known as dwarf forrestii (which is actually a shrub), the African sequoiadendron relative biggus longaeva (which is black in color and known for its great mass), and the Western European placito phallicdendrum (which is more comparable), all of which have become crossbred. The European colonization of North America brought the hybrid morning wood to North America whereas its African, European, and Asian counterparts are for the most part still purebred. The morning wood is identifiable by its bulbous top, long trunk, and spherical roots. The term "morning wood" comes from the tree's perched or erect appearance, especially in the early morning hours which is a result of the tree's natural growth over night in an attempt to gain more direct sunlight exposure, something which the morning wood is often deprived of. It is also known as a tree of extreme toughness. The bark of the morning wood is usually very thick, which makes it very difficult to chop down. As a result, the morning wood makes bad paper. The Asian relative of the North American morning wood, which is much smaller in comparison and actually an ugly shrub. Morning woods undergo an interesting lifecycle. Under normal circumstances, morning woods will last approximately 70 years (this varies) before shriveling up and dying. Morning woods usually don't start their morning perching until they are eleven or twelve years old. Once they reach fifty or sixty, many morning woods will begin their slow decline and their height begins to decrease dramatically (though they stop growing many years before this), eventually reducing themselves down to nothing but stumps. This sort of dysfunction in morning woods may also be seen earlier on, as early as their 20s, 30s, and mid-life. This process can be halted or delayed through the use of specialized pumps or natural herbal supplements which can be purchased off of infomercials. The trees have varying dimensions, which are of much heated debate. Many assert that it is preferable to have a larger morning wood as opposed to a significantly smaller one. Others have claimed that "it's not the size of the wood, it's the swaying of the leaves". Those who grow their own morning woods will often have a layer of bark towards the top intentionally cut, claiming it makes the morning wood "look bigger" as well as having other arguable benefits. Despite popular belief, morning woods do not stand straight up. In fact, a healthy morning wood has a nice curvature and leans in some direction. This is often referred to as a California curve, though morning woods in California are not known to have this feature any more regularly than morning woods of other states. It just has a nice alliteration. Sexual maturity for morning woods is usually around the age of twelve or thirteen when most morning woods gain the ability to produce sap and haploids. Later in their life, the trees usually become impotent. 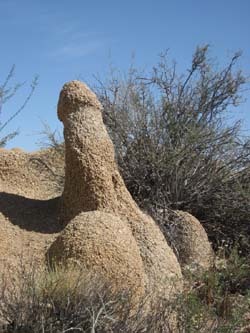 It is not uncommon for morning wood owners to cover their morning woods with a tarp or some sort of similar protective cover to prevent them from breeding. Sexually active morning woods are prone to all sorts of illnesses, most of which can be treated or cured. Some however, are fatal. Morning woods are often harvested for their sap, either by hand, or through the use of sophisticated equipment. Most harvesting is done by hand; however, this process often results in a waste of the precious sap, which is used for breeding further morning woods, if the farmer is lucky. A small percentage of the population are allergic to morning wood sap. In 1993, Lorena Bobbitt was indicted on several charges after chopping down her husband John's morning wood. The arboricultural term for two morning woods growing adjacent to one another (something that is actually quite common in morning woods) is called a "frot" (i.e. "Between the houses was a frot of morning woods."). This page was last edited on 29 August 2012, at 02:28.